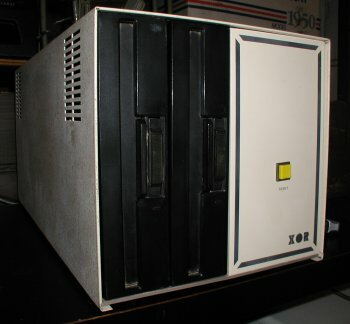 I recently purchased a XOR S-100-4 computer from Jim Battle. With very little work I was able to get this machine up and running. Jim did a great job in restoring it to working order. Another US Micro ad for XOR hardware from Byte April 1983. Delta Products built and sold these S-100 systems. Then their name changed to XOR (at same physical location) and may have been because purchased by US Micro. 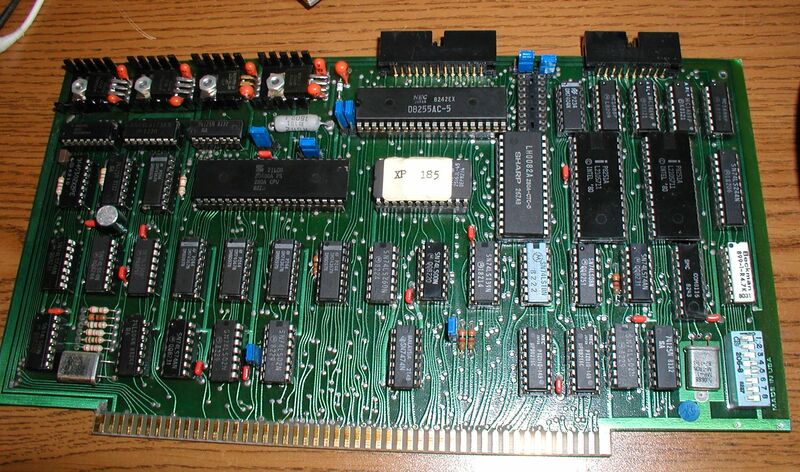 I believe for a period of time bare bone boards were sold as XOR while Delta Product boards were populated. Not real sure anymore. XOR also made early PC clones before disappearing. I have a multi-page US Micro sale booklet and a 1982 price sheet. More info on the Delta Prod/XOR Z-80 board & 64K dynamic RAM boards - they both used S-100 pin 60 (SIXTN) for MREQ* vs. the more common pin 65. 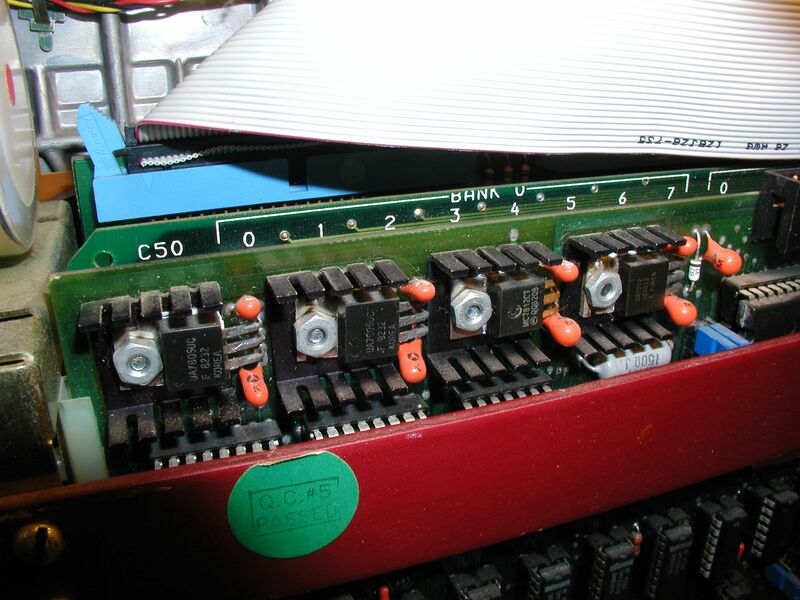 Plus the CPU board can only address 20 address lines and not the full 24 address lines of the S-100 spec's. Easy to change the first one once you are aware of it. Closeup of the CPU I/O card voltage regulators and related components. Click image to larger view. It had been a while since I used this system. I took it out because it's capable of formatting a few 8 inch IBM 3740 format disks (SDSS) needed for testing Digital RX01 drives. DEC did not provide a way to format disks. The system did not boot. Great. 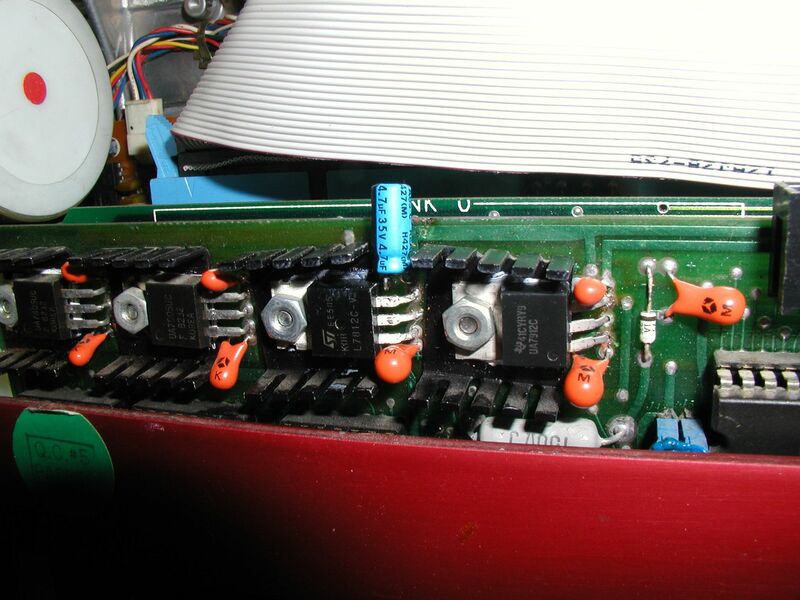 By probing components I discovered I had a blown cap near the 7812 and a bad 1488 driver on the CPU I/O card, possibly blown because of the bad voltage regulator. I made the necessary repairs to return the system to operational status. The 47.uF cap near the 7812 was fried, the heat sink gets pretty hot and that probably diminished it's lifespan. In addtion to the cap I also replaced the heat sink paste and put in a new 12V regulator. Note how the new cap is bent up to help keep it cool. click image for larger view. The serial drivers. It's a clever design, using one cable for two serial ports on the other end with a special adapter to split out the signals on the other emnd. Click image for larger view. IBM 3740 format uses 128 bytes 26 sectors per track, ~241K capacity. There were a lot of disk formats back then, I had to double check I was building the right thing as the old systems are flexible yet cryptic. 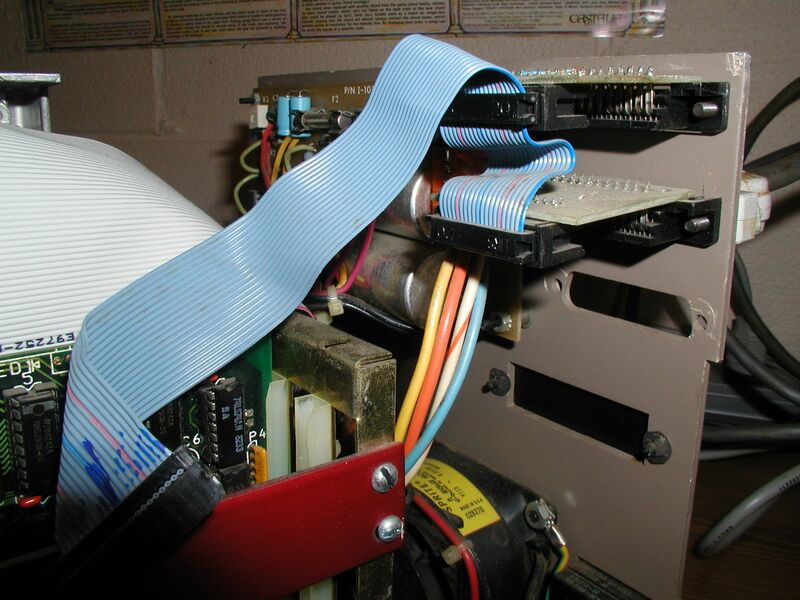 The XOR S-4 system I am using has Mitubishi M2896-63-02U drives, they're 8" DS/DD and the disk controller uses a 1795 FDC chip. NOTE TO FUTURE SELF: The bottom of the two serial ports by default is to be used by the terminal at 9600 baud. Use a NULL Modem cable. When you turn on the system it should put you to the monitor prompt (*). To boot from the left disk drive (drive A) hit CTRL+C on the terminal keyboard. I received the following post from Donald Burns. I have not tested my own 64k RAM card to confirm if I have the issue he describs below, but it's probably a good idea to be aware of the potential issue, especially if your machine's RAM card is not working or like in my case the minus voltage shorted out on the CPU board. I don't want to have to repeat the same repairs. > Good to see this XOR back in use. Mine are down and out until I get the floppy controllers working. One thing to also check is the capacitor on the minus supply on 64K XOR RAM board. 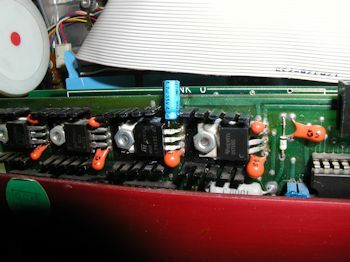 Both the component mask and board component stuffing have the capacitor incorrect. Factory stuffed the board to the mask layout. 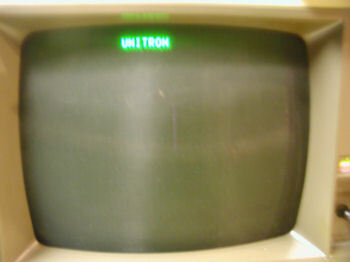 The minus voltage on the board has a cap with the "+" terminal connected to the "-" voltage and the "ground" terminal on the cap is connected to board ground. So the cap's a ticking time bomb and will short out. 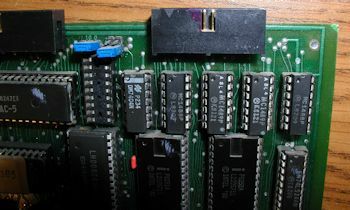 It takes out the minus voltage needed for the 4116 RAM chips. Replace the cap with a new one and DO reverse the leads!!! > I improved the BIOS programing using Z80 instructions in the wait for character input routine so branch if character is present is faster. I also changed the I/O port mask to test all status lines and stop character overflow at 19200 output to terminal. Plus had a several bank RAM disk working. > If you wish to contact me I have quite a bit interest in getting my systems back up and working.